Reverse osmosis units are a real boon to orchid growers. However, because of how they work, they can be considered somewhat wasteful, as well. In this article, I’ll offer some reverse osmosis water conservation strategies that may improve that. First, let’s look at how they work, related to the basic functioning of the membrane. Water passing through an RO membrane is split into two paths – one that passes through the thin film membrane material to block the dissolved solids, and another to flush them away. Traditionally, residential systems are designed to pass three gallons of flush water for every gallon of purified water produced. That is controlled though the use of a flow restrictor in the flush water stream. The units on the flow restrictor are typically given in milliliters-per-minute. In the chart below, you can see some typical specifications, and how the ratios would work with various membrane capacities. Those highlighted in yellow are the standards used on the respective systems. By changing to a smaller flow restrictor, we can increase the efficiency of our systems. For example, for a 100 gpd (gallons per day) system, going from the standard FLOW 800 to a FLOW 550 would reduce the flush water output by a third without affecting the rate of pure water generation. That does have a cost to it however, as by decreasing the flush ratio, the membranes tend to foul more quickly, meaning you’ll have to purchase and replace them more often. From practical experience, I believe anything in the bright green has minimal impact on that and should be applied by everyone, while those in the pale green boxes, while still operating well, will have shorter life-spans. Personally, I’d only recommend going into the “pale green” zones if you really want to conserve water, your water bills are high, or you pay a sewerage charge based upon the water consumption. In those cases, the cost of a new membrane may still end up saving you money in the long run. Another way to increase the efficiency of our RO systems is to manipulate the temperature and pressure of the water entering the system. The output capacity of reverse osmosis systems is typically rated with the input water supply at 77°F and 65 psi at the membrane entrance. Every 10-degrees of difference from that temperature, or 10 psi pressure, affects the output by about 15%, with cooler and lower pressure resulting in decreased output. For example, a 100 gpd system, when operated at 67°F and 55 psi incoming water, will have an true output of just 70 gallons per day, while still generating the same amount of flush water. Conversely, increasing them by 10° and 10 psi results in an output of 136 gpd! 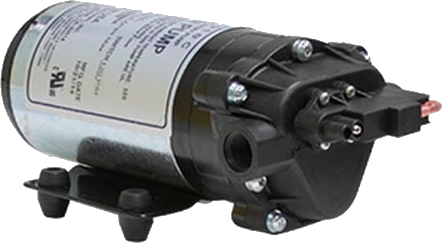 If we can find a way to warm the incoming water and/or increase its pressure – typically done by employing an RO Booster Pump before the system input connection, we’ll be able to run the system fewer hours to refill our tanks, thereby reducing the waste, as well. By far, the best thing you can do to reduce waste is to use the flush water, recognizing that it will be higher in total dissolved solids TDS) than your normal water supply. You can estimate that using the numbers in the chart above. Let’s say we have a true 100 gpd output with a FLOW 550 restrictor on our system. From the chart, we can calculate that the total output is about 100 pure + (100 x 2.09 flush) = 309 gallons per day. We can therefore estimate the all of the dissolved solids from that 309 gallons will be in the 209 gallons of flush water, making the TDS 309 / 209 = 1.48 times the incoming TDS. 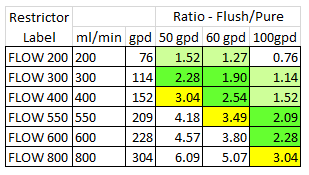 So, if your water supply is 250 ppm TDS, the flush water will be 250 x 1.48 = 370 ppm TDS. Most soil-grown plants will have no issues with that solids content, so using the flush water on gardens and shrubs is a simple and effective disposition. Another alternative for greenhouse growers is to simply spill the water onto the floor, where it will evaporate and humidify the structure. I took a different approach and ran the flush water into an artificial pond just outside of the greenhouse, keeping it full for my pets and the local wildlife; birds, deer, foxes, possums, raccoons, and the ever-present frogs. 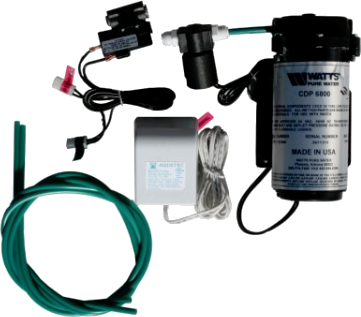 If you want to be certain of 100% reuse of the flush water, you can purchase a “zero-waste” system that uses a pump similar to the booster pump above to inject the water into your household hot water supply.